It is with deep regret that we [record?] the death of Dr. Sampson Altman, which took place yesterday, at the ripe age of 81, all of which have been spent in this "dreadful climate." 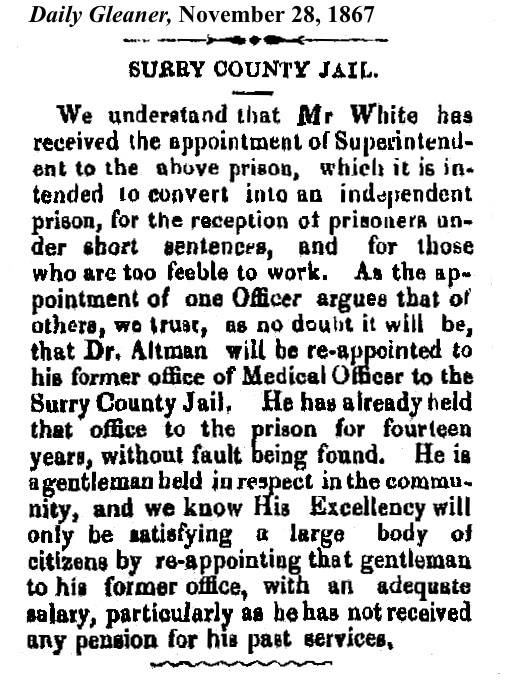 Dr. Altman filled the office of coroner of Kingston for a number of years, having been elected thereto by the people. Under Crown Government the office became extinct, and the Doctor was appointed Health Officer at Port Royal in the room of Dr. Downer, deceased. He filled the office with credit to himself and satisfaction to the public. Old age intervened, and he was superannuated, his place being filled by Dr. Neish, His death is deeply regretted by a large circle of friends. We may mention also that Dr. Altman had at one time an extensive practice in this city, and was for a number of years Medical Officer of the Metcalfe Dispensary, an institution similar to the present City Dispensary. Sampson/Samson Joseph Altman was born probably January 3, 1804, probably in Plymouth, Devon, England, son of Nathan and Brinay Joseph - the name Altman seems to have been a later addition. #Sampson Altman's high society connections came via his mother's father, Abraham Joseph, who was slopman from Plymouth (purveyor of naval clothing) to HRH Prince William Henry third son of George III, and future William IV; the family maintained this royal association for three generations. I have not seen any explanation of Dr Altman's decision to come to Jamaica, possibly along with one of his brothers, Michael Israel Altman. Sampson Altman was recorded in Jamaica as having received his medical qualification from from the London Apothecaries Company, probably in the late 1820s, but I have not been able, so far, to authenticate that qualification. Treasurer, Abraham S. Lyon, Esq. Vestrymen, B. A. Franklyn, P. Phillips, D. I. Davis, M. Aria, S. J. Altman, Esqs. Past Wardens, M. Samuels, D. Jacobs, Hyman Levy, Henry Levison, Louis Lewis, David Alexander, D. Hart, E. Lucas, Esqs. Treasurer for the burial of the dead, Louis Davidson, Esq. 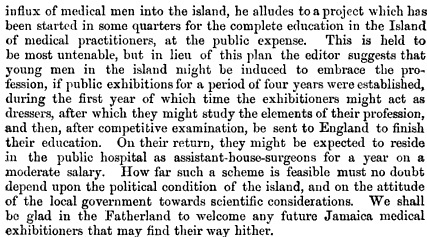 A proof of the estimation in which he was held is found in the fact that within a few months ₤5,000 were subscribed for a statue to him, and a large sum to found an hospital, to be called the Metcalfe Dispensary. The hospital was completed in 1843. Supported by Voluntary Subscriptions and Donations, and Monthly Payments from the Patients. Patron. - His Excellency the Governor. Chairman. - Rev. Thomas Bryett Turner. Vice-Chairman - Rev. Samuel Oughton. Committee of Management. - Rev. Dr. Stewart, Dr. Joseph Magrath, Dr. Alexander Fiddes, John Samuel Brown, Samuel Hendrick, Richard James Cade Hitchins, James Henry McDowell, Henry Hutchings, Edward Lucas, George Silvera, John Nethersole, Colin Campbell, George Delgado, James Kay Fingzies, Rev. Forster H. Almon, Rev. John Radcliffe, and Rev. John Lipscombe McIntyre. This advertisement seems to have appeared only briefly, in 1868, with no indication as to the identity of the indicated two Altman brothers. Sampson Altman probably had an office on King Street, and this facility may have originated as the place where patients could obtain medications he had prescribed. It is interesting to note that the first item listed is 'Turkey Opium' - then sold perfectly legally! [page torn] . . . . before Dr. Altman, Coroner, when it appeared in evidence, that the deceased, whose name was Walter Taylor, was an old man, feeble, and for some time in bad health. He lived at Rae Town, in this city, and had that morning thence to the Railway. He had bought his ticket to proceed to Spanish Town, when he staggered, fell, and before any assistance could be rendered him he died. The Jury returned a verdict to the effect that death resulted from long sickness and debility. ﻿ An Inquest was held yesterday at the Constabulary Office, Sutton Street, in this City, before Dr. Altman, on the body of a female named Louisa Goldson, late of the town of Port Royal, who died suddenly on a piazza in East Queen Street, the previous evening. From the evidence it appears that the deceased had been ailing from disease of the heart and chest, and went under the piazza for repose. The Jury returned a verdict of Died from Disease of the Heart. The lower part of Orange Street and Harbour Street was thrown into considerable commotion yesterday morning, owing to a report having been circulated that a murder had been committed at a tavern called "The Royal Alfred" on Wednesday night. It appears that a common dance was given on the premises to a lot of Sailors, white and black, and a dispute arose among them. The black sailors drew their knives and inflicted several wounds upon the white sailors; one, named John Callaghan died shortly after, and another was taken, to the Public Hospital in a dangerous state. Several persons identified a black sailor named Thomas Williams, now in custody, as having been concerned in inflicting the wound which caused the death of the deceased. The blacks are American sailors who arrived here on Wednesday in the Steamer "Chilian" from Port au Prince, and were part of the crew of the Haytien Steamer "Galatea." There were five of them in custody; and one, named Brown, is not to be found. Alter the affray he appears to have changed his clothes, and is supposed to have left town. The Constabulary are in diligent search of him. An inquest was held on the body of Callaghan yesterday, before Dr. Altman, the Coroner, and a jury of 15, of which Mr. A. H. laaacs was foreman. A post mortem examination of the body was performed by Dr. Gayleard who deposed that on opening the chest he found that the lung on the right side was wounded. The wound commenced in an oblique direction penetrating the chest, and cutting the lung. The penetrating instrument was the cause of the death of the deceased. The Jury returned a verdict of manslaughter against Thomas Williams and John Brown. The others were released. Williams was committed to take his trial, and a warrant will be issued for the apprehension of Brown. Callaghan, the deceased, was belonging to the ship [name illegible]. Under arrangements of April 1869. the Custom-house Officers at nearly all the outports perform the duties of Health Officers: having authority to apply to the Government Medical Officer of the district in which the outpost is situated, for assistance, whenever the slightest necessity arises.